When Chuck asked me if I minded if he paid a visit to his parents the other night, my very first thought was, "Are you going to take the baby with you?" You see, I could wax poetic for days about how much I love my little poop machine, but my relationship with my son has not changed my personality. I am still an introvert through and through. This means, that I recharge and gain my energy by solitude and alone time. There is very little solitude with a newborn, so I cherish these evenings of Mommy's Me Time. I read, I catch up on Netflix (I just started Parenthood- why did no one tell me?!) and this past Friday night, I read emails. Not recent emails, though. I sifted through the folders I had created 2, 3, 5+ years ago with messages saved from friends, family and loved ones. I'm not sure if I'm strange for hanging onto them, but 2 of my most frequent correspondents, my Grandma and my friend, Frankie are no longer with us- so I love the occasional nostalgia that arises from remembering their immortal words. The most recent of my lengthy exchanges with my pen pals, was around 2010-2011, and they pretty much all abruptly stop. I couldn't point you to any specific reason. I had graduated college, and maybe life just got in the way. I think this was also the point when my Grandma's health began to decline and she slowly stopped using her email. Regardless, I miss it. As evidenced by this blog, I live and breathe to write. Where words fail me in verbal conversation, they flow out of me, faster than I can keep up with most of the time, whenever I feel the gentle nudge of a keyboard beneath my fingertips. I want to rekindle my love of letter writing. I want to become a penpal again. I guess that's it. My proclamation. I am hoping to reach out to some old, yet near and dear friends of mine and write what's on my heart. I want to cut the small talk and move beyond new jobs and weddings. I want to write about how motherhood has changed me, how I'm at a standstill in my faith, how I miss being young(er) and standing in the crossroads of terror and wonder at the endless possibilities before me. I want to bare these parts of my soul to a friend and allow them the opportunity to entrust parts of theirs in me. I would love to be penpals! & I save emails like that as well! 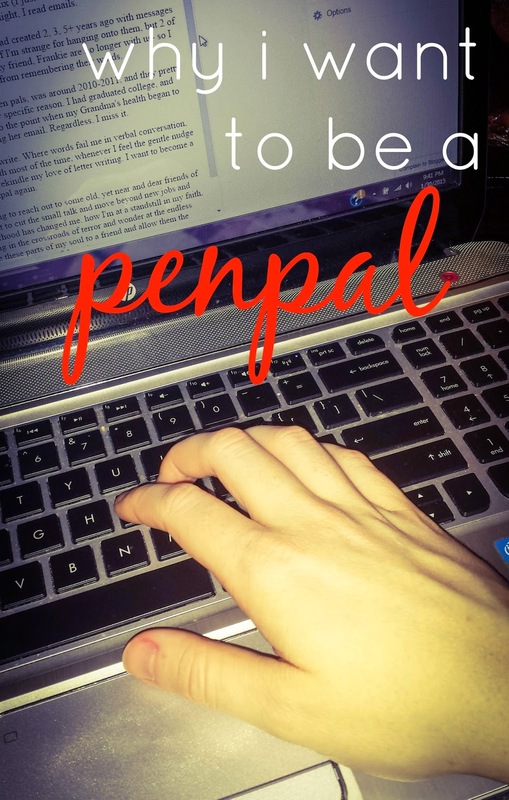 I've always loved the idea of being a penpal too! I guess in a way all of my Internet friends are my pen pals, but it's not the same. Having penpals are cool! I Miss it.